Switch the verb in the marketing objective to generate novel ideas. 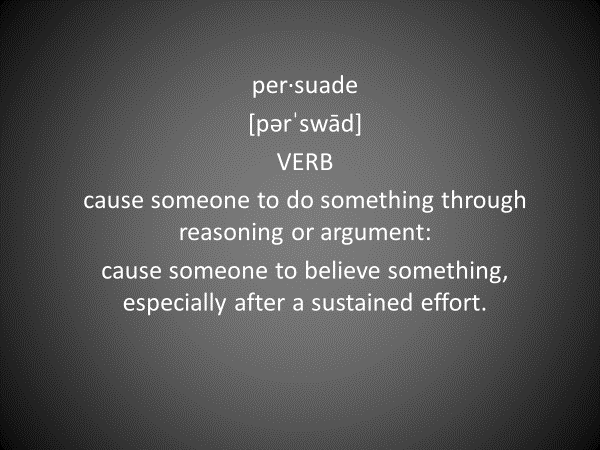 It makes sense to use the verb "persuade" in the marketing objective. Verbs imply action and after all, the ideas you facilitate and the campaigns you develop must persuade a target consumer to take action with a product or believe its valuable point of difference. Inserting a new verb in the marketing objective statement is a technique that can inspire your resource group to have a little fun while they think differently about the objective. For example, let's say the marketing objective is a branding objective like: Persuade a woman who owns a 10+ year-old home to believe that Wrenches and Pipes Plumbing is the most dependable plumber in town. Imagine how different the ideas would be if you switched "persuade" to "command!" If instead, your marketing objective is an activation objective such as: Persuade a woman who owns a 10+ year-old home to book an appointment for a Wrenches and Pipes Plumbing drain check this spring. Imagine what novel ideas you might add to the list by switching "persuade" to "bribe." Next time your resources group needs a little inspiration, try using one of these verbs to switch it up! Contact Coach K for more ways to switch it up.